This is an original Buffalo 66 poster from 1998. 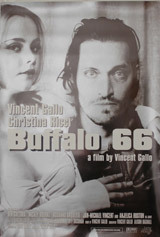 Some of the original Buffalo 66 posters had glitter added to the title text, and some were left plain. These posters have plain text. These posters have been in storage for several years, and there is some minor crumpling along edges. Professional framing is advised.